There’s no dearth of Japanese grill joints in Singapore, so when a happy hunting ground for Japanese comestibles such as Emporium Shokuhin opened it doors, you’d anticipate the resultant Gyuu+ amongst eight different restaurants in the hypermarket. 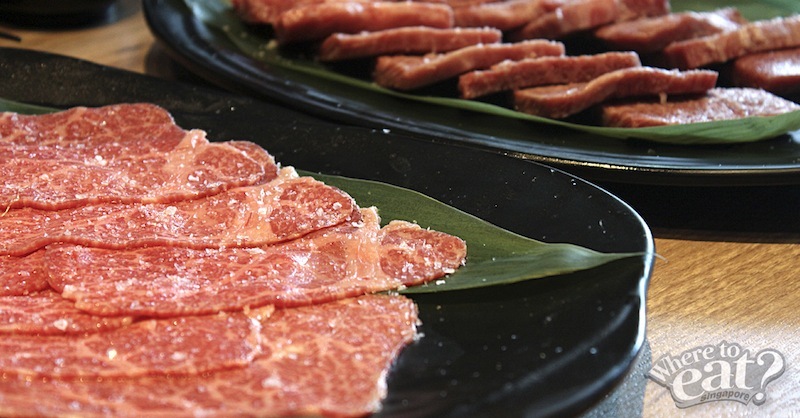 Beef, especially the A5 Japanese Miyazaki, are a specialty at Gyuu+, with Kurobuta pork and live seafood on the menu. Their USDA Prime, Australian beef and Japan A5 Miyazaki, comes in 14, 21 and 28 aging days; their taste matured and ready to make its way to the grill and onto your plate. 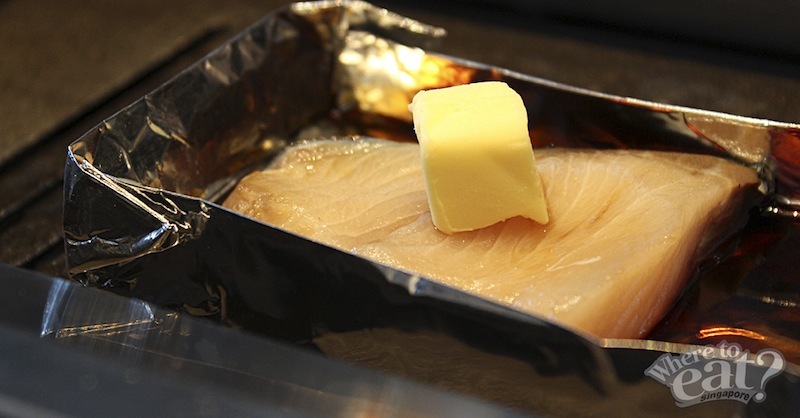 To warm up the palette, we start off with a light bite – Hamachi fillet in shoyu butter – fish drenched in Japanese shoyu and a slab of butter atop. If the waiter or waitress offers their hand in grilling, let them do so. Grilling skills matter for Hamachi fillet and It takes a certain level of flipping and turning to attain the right doneness. A5 ‘Miyazaki’ Zabuton, just like any other meats that are served to us, are meant to be seared over indirect fire, which makes it almost impossible to dry the meat out. In just a matter of minutes, thin slices of the cushy meat comes delivering to your plate. Gulp it down and you can find its fragrance lingering between your teeth. 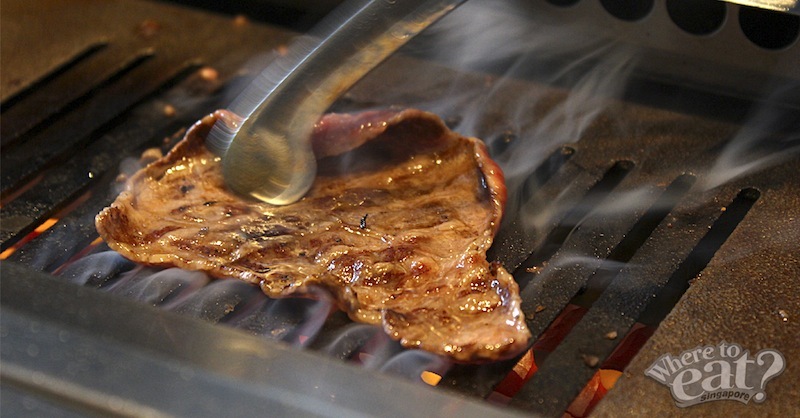 A5 ‘Miyazaki’ Shin Shin has the best proportion of fat to meat, which yields juicy meats that won’t cause flare-ups on the grill when excess grease hits the coals. Don’t think about biting a piece in half, bring the whole thing in and behold the heady perfume of buttery meat. 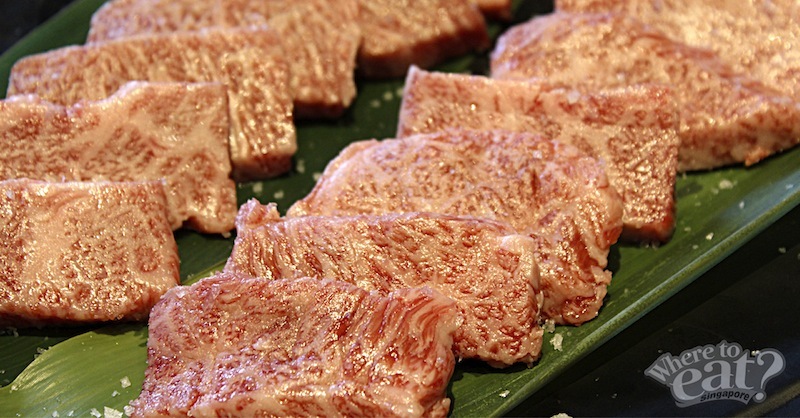 A visual stunner, A5 ‘Miyazaki’ Misuji dons a pretty marbling on each thin slice, which is meant to be cooked quickly over the grill, so the proteins don’t dry out. Absolute recommendation to order a serving of Japanese rice to go with this. Oh, and we didn’t emphasize this enough: the ventilation is one of the best one we’ve ever come across since the mechanism is at the grill itself, so it wouldn’t even touch any part of you by a bit. Great if you have a party to attend or a movie to catch afterwards without anybody noticing what you had before that. 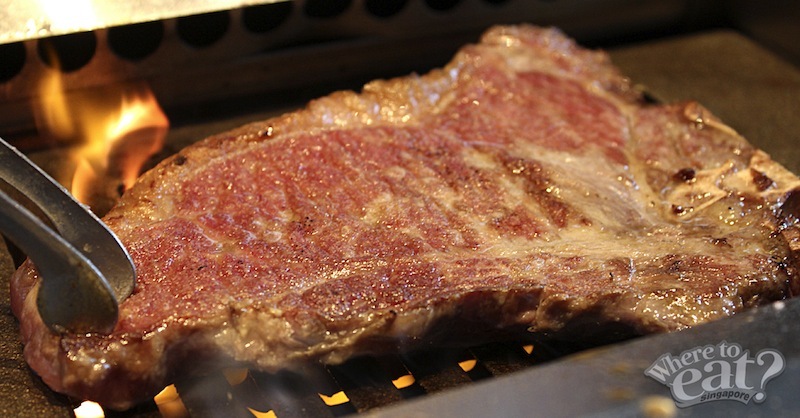 Esteemed by the grill restaurant, 28-days aged A5 ‘Miyazaki’ Jo Karubi definitely hit home run in the marbling section. The remarkable marbling indicates a well-balanced smack of fat and meat. Just a reminder, because this has went through 28 days of aging process, the intensity and ferocity of taste is bound to hit you with the first bite, but gradually gets gentle as you get used to it. Imagine eating beef mixed with a tiny bit of blue cheese, funky mushrooms and truffles. That’s almost the best to describe how 28-days aged USDA Steak Sirloin bone-in taste like. A sizable chunk of buttery sirloin sears over ambitious fire to seal its juices, and flipped over from time to time for even cooking. The texture is sturdy yet tender, and its taste thick and luscious. Gyuu+ Reiman is like the modest cousin in the family whom has in fact, gotten full scholarship from Harvard. With seemingly endless beef in your face, this bowl of amazing noodles almost took centre stage in this entire eating process. 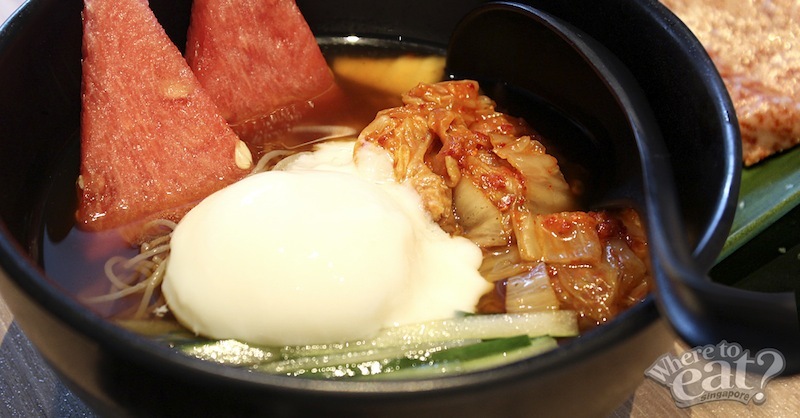 Potato starch noodles in a light bonito broth tinged with white vinegar, watermelon, kimuchi, cucumbers and a poached egg; Gyuu+ Reiman superbly balances your fatty, smoky proteins. 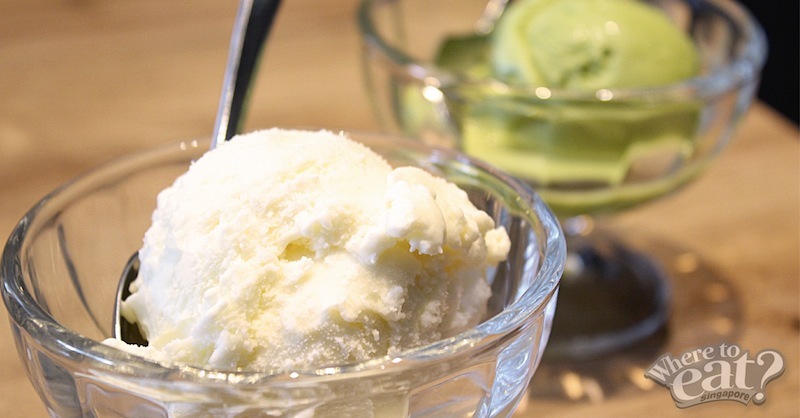 Yuzu, black sesame, red bean, and matcha: these are the 4 flavors of ice cream that Gyuu+ serves. If you ever fell in love with any of their flavors, feel free to buy them from the hypermarket. Located within Emporium Shokuhin in Marina Square, Gyuu+ Yakiniku Grill is outfitted in warm earth tones and wood panelling, evoking a comfortable and cosy feel. The large convivial main dining area is separated from a booth seat area which is perfect for couples, and a semi-private area suitable for large groups.